Nos. 41 and 42 are a pair of seventeenth-century houses that were probably refronted in the eighteenth century and now have a modern restored front. They are Grade II listed (list entry 1047328). They have always been in the parish of St Michael-at-the-Northgate Church. The Blue Lion pub was at No. 41 in the first half of the nineteenth century, until 1845. The last landlord was George Garlick, the baker at No. 42 next door, and the two shops then combined to form a wine & spirit merchant’s. In 1962 Nos. 41 and 42 were converted into one shop by Salisbury’s Leather goods (photograph). 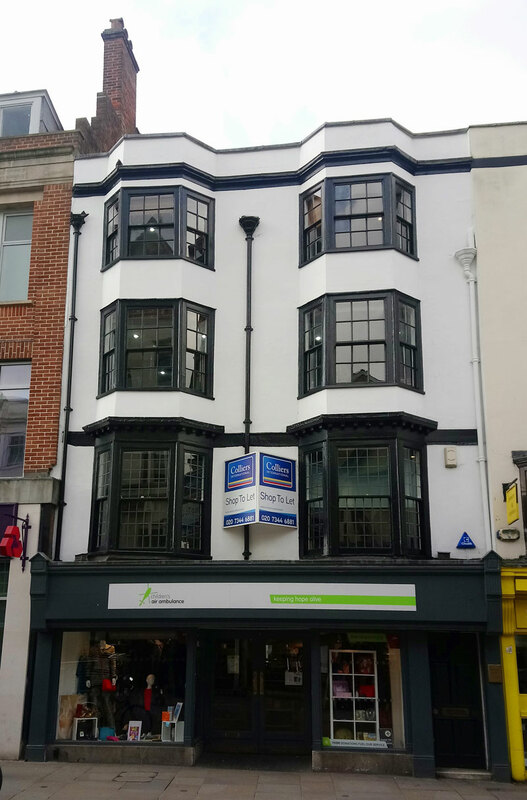 Occupants of 41–42 Cornmarket Street listed in directories etc. James Slatter Steane & Co.
No. 41 (Blue Lion): James Prior (40), victualler, lived here at the pub with Eliza (40) and Emma (9) and Harriet (6). Living with the family was one female servant, and an independent lady aged 50. No. 42: The grocer George Garlick (30) lived here with Anne (30) and Lucy (40), plus an apprentice shopman and one male and one female servant. No. 42: John C. Blake (30), described as a wine merchant, lived over this side of the shop with his wife Louisa (30) and two wine merchant’s clerks. They had one servant. No. 41: Described as uninhabited. No. 42: Jane Steane (64), described as the widow of a wine merchant, lived here with her bachelor son James Slatter Steane (32), a wine merchant. They had one female servant. No. 42: James Slatter Steane (42), wine merchant, lived here over his shop with his wife Eliza (32) and their children Marian (6), Ruth (5), Amy (4), and Edward (2), plus his widowed mother-in-law Rebecca Allin. They had a 15-year-old servant girl. No. 41: Described as uninhabited again. No. 42: Jane Steane (64) continued to live here with her bachelor son James Slatter Steane (32), a wine merchant. They had one female servant. No. 41: Walter Thompson (33), a fancy draper, lived here over his shop with his wife Lucy (29) and their son Reginald (1) plus one domestic servant. A draper's assistant also lived with them. No. 42: Listed as uninhabited, but named as the Blue Lion. No. 41: Described as uninhabited and not in occupation. No. 42: Described as uninhabited but in occupation. No listing for either shop.